The state Attorney General’s Office has found that aerospace company Electroimpact discriminated against Muslims and single people. A nearly yearlong investigation followed a Seattle Times story revealing a controversial workplace culture shaped by founder Peter Zieve. Electroimpact, a prominent aerospace supplier whose president voiced hatred of Muslims and encouraged his mostly white engineers to marry and procreate, has entered into a consent decree with the state Attorney General’s Office that requires the company to pay $485,000 and takes its controversial leader out of direct hiring. The court-monitored decree, in effect for 42 months, stems from a nearly yearlong investigation, which concluded that the Mukilteo-based company violated state law by discriminating on the basis of religion and marital status. 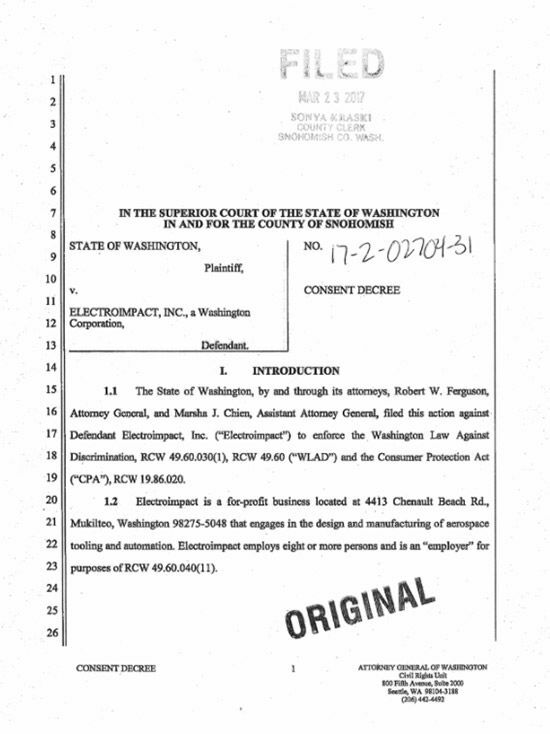 Read the complaint: State of Washington vs. Electroimpact Inc.
Zieve offered financial incentives to workers who married and had children. And he organized a campaign to stop construction of a Mukilteo mosque. The president, who has not yet responded to requests for comment, told The Seattle Times last year that he refused to be politically correct. He said he treated his employees like family, throwing them a big Christmas party every year. Chief of Staff Ben Hempstead said then that Zieve’s controversial opinions did not affect the company’s mission. Reached Thursday, Hempstead forwarded a statement he distributed to employees that noted changes to the company, including in hiring. “What hasn’t changed is our commitment to providing world-class aerospace assembly systems and being a great place to work,” it said. In the consent decree, which stops the Attorney General’s Office from moving forward with a lawsuit, Electroimpact denies any wrongdoing. “Employees in businesses in our state should not be subject to the type of atmosphere that this gentleman created and fostered,” he said in an interview alongside lawyers from the civil-rights unit. Since Ferguson founded the civil-rights unit two years ago, it has concluded two other employment cases. One — against car dealers in Spokane and Idaho that were accused of sexual harassment and discrimination — resulted in a consent decree requiring the companies to pay $280,000. It was alarming not only that it was happening today, but in a sizable company, she said. With roughly 800 employees and offices around the world, Electroimpact designs and manufactures cutting-edge and sometimes massive machines used by Boeing, Airbus and others to build planes. The tooling company hires top engineers and gives them an unusual amount of autonomy. Zieve, an engineer himself and founder of the company, personally handled much of the hiring, reiterated a complaint by the Attorney General’s Office filed in Snohomish County Superior Court on Thursday at the same time as the consent decree. He placed ads, interviewed candidates and asked for their photographs to screen — or screen out — applicants. He nixed those who looked as if they might be Muslim, or had a Muslim name, the complaint charged. The document quoted liberally from Zieve’s emails equating Muslims or refugees from predominantly Muslim countries with terrorists. The complaint also noted that Zieve used company resources to organize a “mosque-watch” group. Although not mentioned in the document, Zieve last year sent anonymous postcards to Mukilteo residents to let them know of the planned mosque. There was a “sort of eugenics aspect” to Zieve’s promotion of marriage and family, Chien said, referring to the email about backfilling the country with rubbish. He dispensed “marriage bonuses” that at one time amounted to $1,000. Speaking to The Seattle Times last year, Zieve called the money “gifts” that came from his heart. The Washington Law Against Discriminationbars workplace discrimination on the basis of marital status. It does not, however, bar such discrimination from family status (as state law on housing discrimination does), so the complaint does not mention profit-sharing allocations to workers based on the number of children they had. Some of Zieve’s employees shared his views. The complaint quotes from a number of their emails, often mocking Muslims and shared on a company “Jokes” listserv. That helped created a hostile workplace, according to the Attorney General’s Office. Those who objected sometimes faced retaliation, including an order to leave the company — another violation of state law, according to the complaint. The $485,000 paid by Electroimpact will go toward compensating victims of the company’s discrimination, harassment or retaliation. Chien said she expects some of the approximately 10 current and former employees she interviewed to qualify. In addition to barring Zieve from most hiring decisions, the consent decree mandates that Electroimpact update its nondiscrimination and harassment policies, train employees about state discrimination law and make good-faith efforts to diversify its workforce. Roughly 95 percent of the company’s engineers are white, according to a company report submitted last year to the U.S. Department of Labor. Some of those efforts must be semiannual recruiting events with minority groups such as the Muslim Students Association. Electroimpact also hires few women, who represented 3 percent of its U.S. workforce in 2016. But the Attorney General’s Office didn’t focus on gender discrimination. “It’s rare to cover every conceivable ground,” said Colleen Melody, chief of the civil-rights unit. Will the consent decree — which requires reporting on recruiting and hiring but does not set quotas or goals — change Electroimpact’s demographics? “I would say I just don’t buy it,” Chien said, noting Electroimpact is located in a metropolitan area near the University of Washington and not far from California, all of which offer a diverse talent pool. At the UW’s College of Engineering, for instance, Asians last year represented about 20 percent of students earning undergraduate degrees in mechanical or aeronautics and astronautics engineering.